Valves 1 and 2 are energized together so the flow from each valve meets smack dab in the middle and flows down the center dispenser chute to the fabric softener cup. If one or the other valve do not work OR if the flow is greater out of one valve compared to the other, then the flow will not meet in the middle and be sent down the center chute. 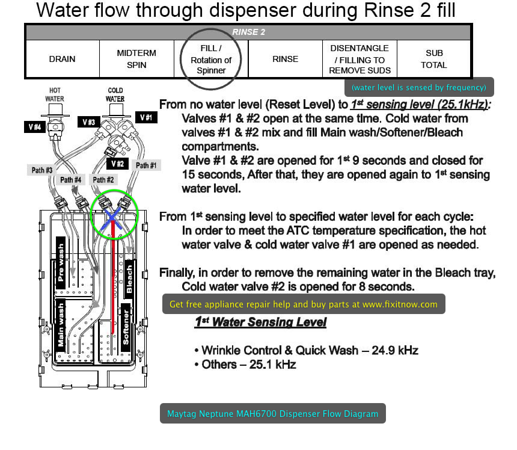 Use the tech sheet taped to the rear panel of the washer and run the diagnostic mode to power each valve and get a visual on the flows. Also, make sure the top of the dispenser above the softener cup is not clogged with softener. This entry was posted in Washer Repair on February 21, 2011 by Samurai Appliance Repair Man.